You've finally landed your first real job. And with that, comes your first real paycheck. This is a monumental occasion and should be celebrated. But what should you do? Should you blow all of your funds on an expensive and wild weekend? Should you buy a new wardrobe? Or should you just pay your bills and save the rest? The answer to this question depends on your overall financial plan, your budget, and your surplus once you've met all of your obligations. An important thing to do once you receive that first check (preferably before) is to establish a plan. It's OK to splurge a little and celebrate the fact that you are officially a taxpaying, adulting member of society. However, it's critical that you use this first paycheck to jump-start your journey to financial independence. 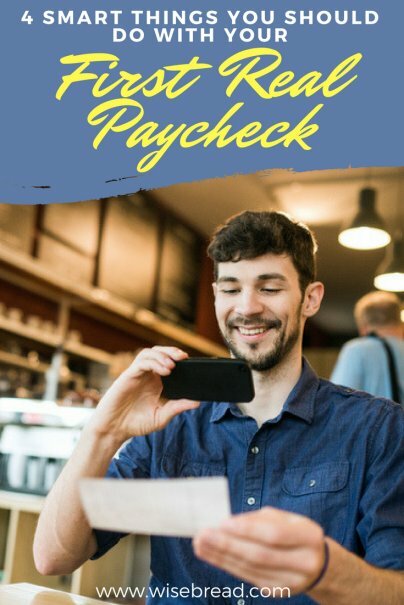 Here are some important money moves you should make with your first real paycheck. This sounds ridiculous, I know. But one of the biggest challenges people with newfound wealth face is getting used to having money. One of the most important things to remember is that your thoughts, beliefs, and attitudes about money directly influence how you spend it. When you're not used to having it, it's easy to spend a small windfall immediately. And often, you overspend. You have to give yourself time to acclimate to having money. Paradigm shifts take time. Allowing your checking and savings account to remain full can be difficult. If possible, allow the money to sit for a while. Pay your bills and let what's left breathe. Buy only what you absolutely need, at least at first. You don't have to go out to eat, buy new clothes, or cop a new ride just because you're earning steady money. Begin conditioning your mind to enjoy seeing a positive checking and savings balance. And vow to keep the trend going. The most important thing to do with that first paycheck is to create a budget before you spend a dime. Once you see exactly what you're working with, establish a spending and savings plan by creating a zero-based-budget. You want to give every dollar a purpose. There's no such thing as leftover money or a surplus. Every dollar is accounted for, and if you do find a way to save a buck, that buck goes to savings. When you receive your first paycheck, make a list of all of your regular monthly bills, debts, and necessary expenses along with the due dates, in order of importance. This not only helps you see what needs to be paid and when, but it also helps you establish payment priorities in case there ever is a shortfall. After you've listed and prioritized your bills and expenses, it's important that you add savings to the budget and move it to the top of the list. It should be ahead of everything. Your budget shows you how much you owe and how much you have left after the necessities are paid — which allows you to determine how much you should save each month. The old financial advice, "Pay yourself first" is still very true and should begin with your first paycheck. Start by establishing how much you can afford to save and lock in that number. If possible, set up an automatic transfer so that as soon as your paycheck is deposited into your bank account, your savings amount is automatically transferred to another dedicated savings account. That way you never see the funds. You won't miss what you never see. After you've gotten your budget in place and saving money is at the top of the list, it's time to set some financial goals. Setting financial goals is important for a variety of reasons. It helps you stick to a realistic budget. It puts something concrete out in front of you and challenges you to go get it. It gives you a purpose for earning, saving, and spending money. Even if you don't reach your goal, you still make progress and move forward. Setting financial goals allows you to view money as a tool that will help you live an independent life. Your first few goals should be to live by your budget, maintain a healthy emergency fund, and kickoff your retirement savings. From there, make other goals that will help keep you on track, such as eliminating debt or paying cash for your next car or vacation.